Hello, lovelies! I got my November Birchbox in the mail yesterday, so I am here to share with you all what I received in my box. 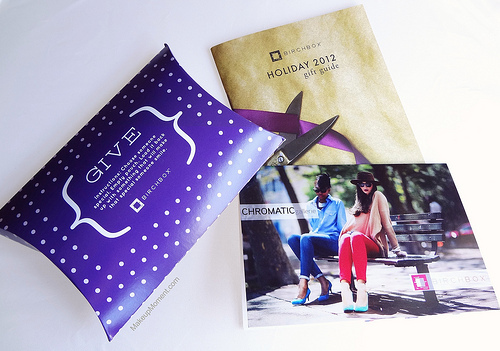 This month's Birchbox theme is all about giving back, and being thankful. Along with the essence of giving, this month Birchbox is donating to Art of Elysium-a non profit where musicians, artists, actors, and designers help children who are going through medical conditions. It's always great to see companies give back by supporting awesome causes. Take a look at what was inside my box this month! Instead of the usual tissue paper that a few of the items usually come wrapped in, this time around, a few of the goodies were stored in this super cute purple box, which is indeed reusable. Bonus! I also received a $15 off coupon for Chromatic gallerie, and a pretty nifty Holiday gift guide that is filled with tons of gifting ideas for everyone. 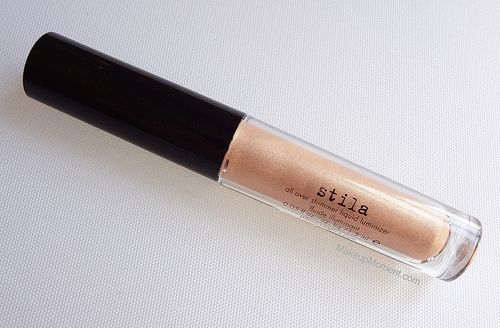 Stila All Over Shimmer Liquid Luminizer in Bronze Shimmer: I was so excited to see this luminizer included in my box. I have been really into highlighters lately and this one is a nice addition to my collection. The cold weather has been dulling out my complexion so anything that can give it a lively boost is very much welcome. The golden bronze coloring along with the shimmer flecks are stunning, and I can't wait to try it atop my cheekbones. 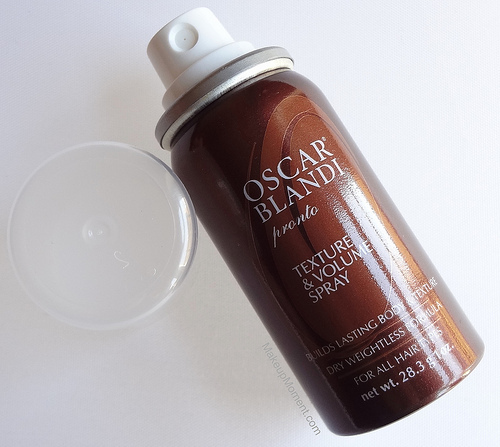 Oscar Blandi Pronto Texture & Volume Spray: When it comes to my hair, I don't usually fancy a whole lot of volume in my hair. But, I guess a little volume here and there isn't too bad-as long as it isn't over the top. This lightweight hairspray helps give locks a voluminous boost, for an alluring tousled look. Sounds promising! Miracle Skin Transformer Vanish Instant Imperfection Corrector: Thanks to the inclusion of optical diffusers, this serum-infused primer helps mask imperfections, to then create the illusion of smooth and bright skin. 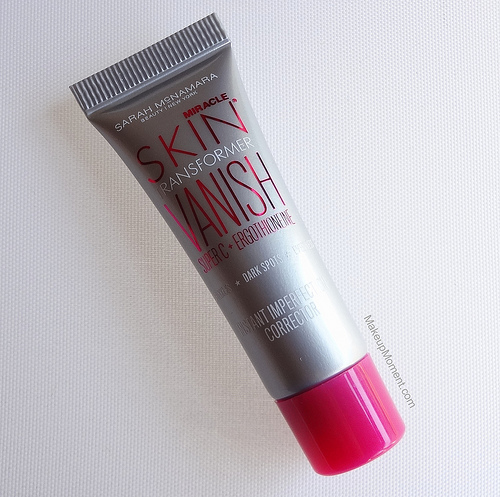 This product also helps improve skin tone and texture with prolonged use. Sounds interesting. I am excited to use this, as my skin has been on the dull and uneven side, lately. Atelier Cologne Rose Anonyme Cologne Absolue: This fragrance smells absolutely lovely. The ginger, bergamot, and the rose notes induce a comforting, warm scent that I find so appropriate for the colder season. Along with the fragrance, came a super chic postcard, that was a very nice touch. 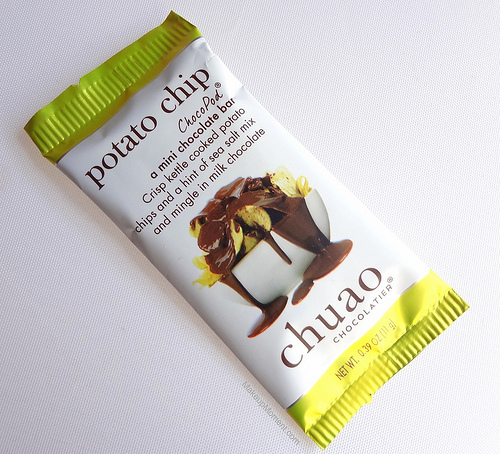 Chuao Chocolatier Potato Chip ChocoPod: The lifestyle extra this month was this yummy chocolate bar. I love that this gluten-free treat doesn't contain artificial ingredients like preservatives, sweeteners, and hydrogenated fats. Overall: I am pretty pleased with this month's Birchbox. It was definitely a step up from last month's box, which I wasn't too excited about. I am happy that the contents in this box are nicely balanced out thanks to the assortment of skincare, makeup, hair care, fragrance, etc. There is something for every need and that's always something I appreciate when it comes to beauty boxes. If you are interested in signing up for Birchbox, you can do so by using my referral link if you'd like. What did you all receive in your November Birchboxes? Were you happy with this month's contents? Disclaimer: I purchased a monthly Birchbox subscription for my personal use. If you sign up using my referral link, extra Birchbox points will go into my account, that are good towards future purchases in the Birchbox shop. I would be so excited to see that Stila highlighter! It looks really pretty! I haven't used it yet, but I did a quick swatch on my hand and it looks really nice! I am going to try it on tomorrow for a family Thanksgiving dinner party :) Have an awesome Thanksgiving, Aly! The Stila Luminizer looks gorgeous! And someone mixed potato chips with chocolate?? I am in love. LOL! The potato chip chocolate thing was such an interesting concept. I don't think I have ever heard of anything like it. The chocolate was sweet for the most part, but there was a little hint of saltiness to it as well, that kicks in after a bit. I loved it! This was a really great month! !